Have you been watching Fox’s new show “Gracepoint”? It’s the new 10-episode mystery, based on the successful BBC drama “Broadchurch.” Set in a Northern Californian fictional seaside town of Gracepoint, the mystery begins with the disappearance of a young boy. And I am positively hooked! As I understand it, the first couple of episodes of “Gracepoint” and “Broadchurch” are identical from scene to scene, including main character Emmett Carver, played by Scottish actor of “Doctor Who” fame, David Tennant (although Tennant puts on a dubious and often criticized American accent in “Gracepoint”) but that is where the similarities end. I haven’t seen “Broadchurch” but I understand that the killer is different in “Gracepoint” and that they’ve taken the plot a different direction. So far, in the first four episodes, they’ve done a great job moving the plot along and throwing plenty of twists there and I like the American seaside setting almost as much as I like Anna Gunn from “Breaking Bad” playing Detective Ellie Miller. If you’re hoping to see “Broadchurch” airing somewhere in the U.S. as I have been, it’s unfortunately going to cost you. I haven’t been able to track it down on the usual suspects of Hulu, Netflix, BBC America or Amazon Prime. It is available on iTunes for download. 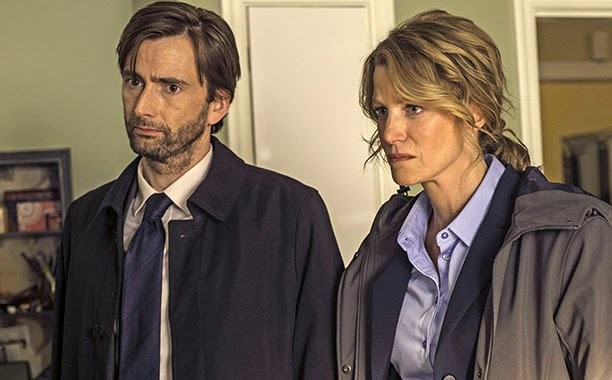 British viewers can watch full episodes of “Gracepoint” online. So … if you’ve seen “Broadchurch” or “Gracepoint,” What do you think of them? Posted on 29, October 2014, in TV and tagged BBC, Broadchurch, fall TV, fox, Gracepoint, mystery, telly, TV. Bookmark the permalink. Leave a comment.